We picked up our first toyhauler, Vengeance 25V, 2 months ago and are still learning how to operate it. We have a Powerstroke generator we picked up at Home Deport during the past hurricane season for household use. It is 6000 running watts generator. It has 4 L5-2R power outlets and 1 L14-30R power outlet. Can I use this generator on my toyhauler? Do I need to use any adapters? or do I need to get a different generator? What do the L14-30R code on the one power outlet means? This is our first experience with trailers and want to make sure I don't do something wrong. Thanks. 1. You'll not be anyone's friend at a campground with this open framed generator howling away. 2. You can adapt down to any one of the four 20 amp 110 VAC outlets, but it'll be a strain to run an A/C and much anything else on that small of an extension cord. 3. I'm concerned with the advertising saying the 30 amp outlet is 240VAC. You don't want 240 VAC running to your RV like a stick house has. I wouldn't bother using that with the TH for the reasons mentioned above. That's a big genny to only get 20A to your trailer and it's going to be quite loud. Not a big deal if you're dry camping with nobody else around, but if you have other campers nearby they're not going to like you very much. If you want an RV generator that won't break the bank then check out the Predator from Harbor Freight. A comparable Honda EU genny will run about $2,000. 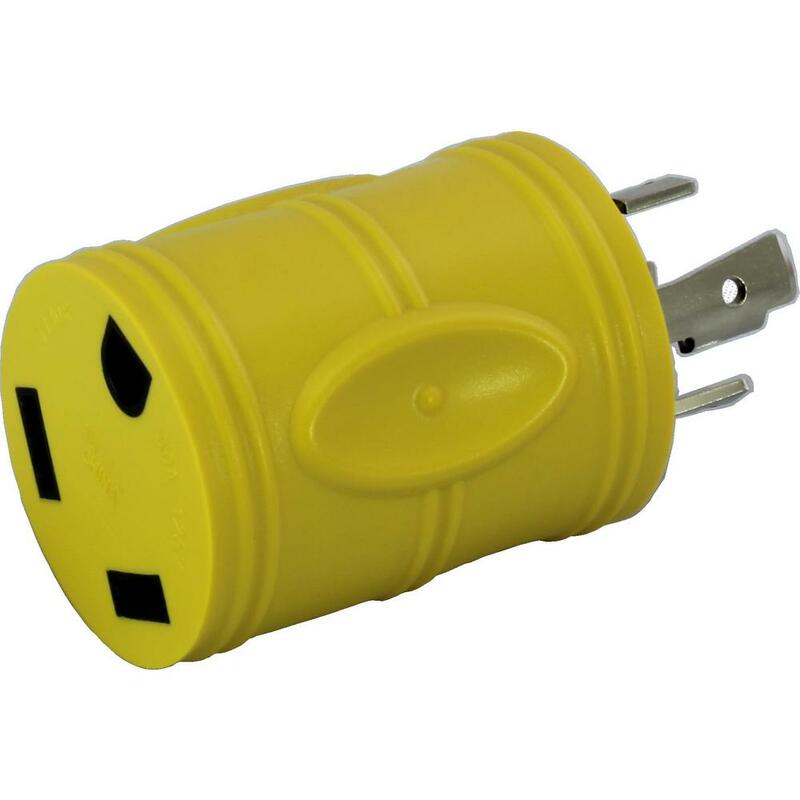 They make an adapter to plug an RV style 30 plug to the 120/240 outlet on your generator. I'm not sure if yours has the 120/240 switch but my generator has a selector switch so I can use the full wattage from the 30 amp L14-30R outlet at 120V. That said, I would never use mine in a campground as it is loud. Was purchased primarily for power outages at the house. You will not make any friends using something that big and loud in a campground. Alot of campgrounds have limits on how loud gennys can be. Get yourself an inverting generator. They are alot quieter and produce power that's safe for sensitive electronics like laptops. That generator can supply more than just a single 20 amp. An adaptor needs to be made or purchased to connect the trailer cord to the generator. Make sure to get said adaptor from someone who understands 99.9999% of trailers use 115VAC ONLY....NOT 230 VAC like a house! Thanks everyone for the advices. Yes, that genny is pretty loud . I will be getting the HF genny recommended above! Not true. 50A campers use 230VAC. The voltage gets split into (2) 120VAC buses inside the main breaker panel. Your house does the same exact thing. Not true. 50A campers use 230VAC. The voltage gets split into (2) 120VAC buses in side the main breaker panel. Your house does the same exact thing. Said another way, 50A campers use two 115 VAC lines (L1/neutral/ground and L2/neutral/ground). So yes, both L1 and L2 runs to the camper, but it is never used as 230VAC. Only as two 115VAC lines. To be precise, there is what I belief to be a very rare exception. Apparently SOME campers are known to use 230VAC. Presumably for an oven or cloths dryer, some other high power load. I've never seen this myself. My real message here is be very careful wiring to a camper...more than one poor soul has plugged a camper into 230VAC. The usually happens when a 30 AMP camper receptacle gets wired like a household cloths washer receptacle. Not good!